Becquer, A., Torres-Aquino, M., Le Guernevé, C., Amenc, L. K., Trives-Segura, C., Staunton, S., Quiquampoix, H. and Plassard, C. (2017). Establishing a Symbiotic Interface between Cultured Ectomycorrhizal Fungi and Plants to Follow Fungal Phosphate Metabolism. Bio-protocol 7(20): e2577. DOI: 10.21769/BioProtoc.2577. In ectomycorrhizal plants, the fungal cells colonize the roots of their host plant to create new organs called ectomycorrhizae. In these new organs, the fungal cells colonize the walls of the cortical cells, bathing in the same apoplasm as the plant cells in a space named the ‘Hartig net’, where exchanges between the two partners take place. Finally, the efficiency of ectomycorrhizal fungi to improve the phosphorus nutrition of their host plants will depend on the regulation of phosphate transfer from the fungal cells to plant cells in the Hartig net through as yet unknown mechanisms. 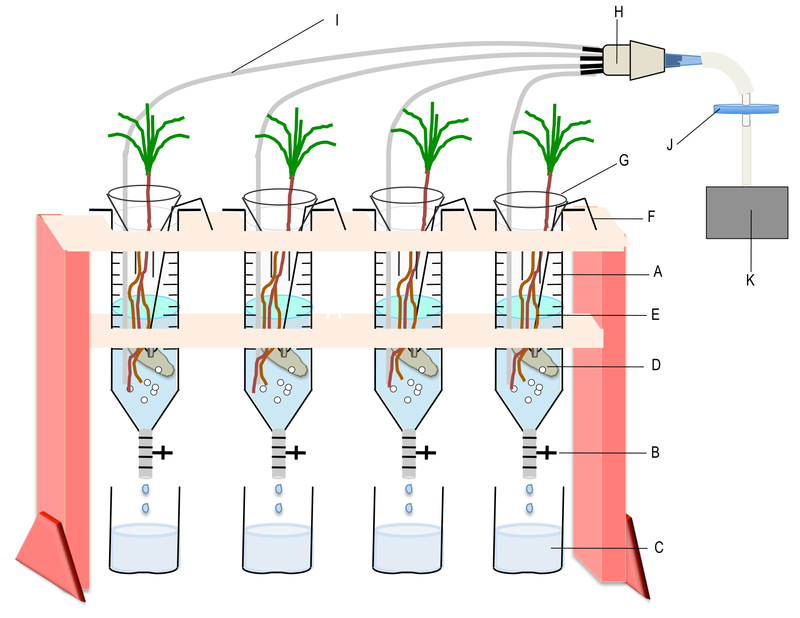 In order to investigate these mechanisms, we developed an in vitro experimental device mimicking the common apoplasm of the ectomycorrhizae (the Hartig net) to study the phosphorus metabolism in the ectomycorrhizal fungus Hebeloma cylindrosporum when the fungal cells are associated or not with the plant cells of the host plant Pinus pinaster. This device can be used to monitor 32Phosphate efflux from the fungus previously incubated with 32P-orthophosphate. The association between mycorrhizal fungi and plants is known to improve plant P nutrition (reviewed by Smith and Read, 2008; Plassard and Dell, 2010; Cairney, 2011; Smith et al., 2015). This positive effect is due to P uptake and P transport through the fungal cells exploring soil far away from the roots. The capacity of the fungus to take up P from the soil solution and to release P to mycorrhizal roots is therefore an important feature for its positive effect on plant P nutrition. In ectomycorrhizal symbiosis, we know (i) that the exchanges between the fungus and the plant occur in the Hartig net, located inside the ectomycorrhizae, and (ii) that there is no direct cellular connection via, for example plasmodesmata, between the plasma membrane of the fungal and the plant cells. Therefore, these exchanges are very difficult to study as they occur in the apoplasmic space of the Hartic net. Here, we describe an in vitro system enabling us to mimick this apoplasmic space for the ectomycorrhizal fungus Hebeloma cylindrosporum incubated with its host plant Pinus pinaster (Torres-Aquino et al., 2017). This method could be used with other fungal or plant species. Cut with a glass knife small pieces (around 5 cm long) from a glass tubing (ext diameter 8 mm, equipment #14 in the Equipment section), hold the cut piece with a pair of tweezers and polish each side over a flame. Glue one piece of cut glass tubing inside a test tube (equipment #15 in the Equipment section), with silicone paste as shown in Figure 1. Place the tubes on a rack and leave them to dry for 24 h.
Cut the PTFE microtube (material #4 in Materials and Reagents section) in pieces of 25 cm and 30 cm long. Place one piece of each length inside the glass tubing and fill the space between the glass and the microtube with silicone paste. The long microtube will be used to supply nutrient solution whereas the short one could be used to withdraw the solution or to supply aeration. Leave to dry for 24 h.
Cut small pieces (20 mm) of silicone tubing (internal diameter 1.14 mm, material #11 from the Materials and Reagents section) and place it over the end of a PTFE microtube. Close the extremity of a 200 µl tip by passing it through a flame. After cooling, insert the burned extremity into the second opening of the silicone tubing to obtain a stopper to close the microtube. Cut pieces of filter paper Whatman of 34 x 125 mm and place one per tube. Add 10 ml of glucose solution in each tube. This volume is enough to saturate the filter paper. Place the rack with tubes in an autoclavable bag. Close it with tape and put another autoclavable bag. Close it with tape and sterilise the whole at 115 °C for 40 min. Repeat the sterilization after 48 h. Glucose will promote the germination of spores of unwanted saprophytic fungal species belonging to the genus Penicillium, for example, that will be killed by the second sterilization. The tubes are ready to receive a germinated seed. 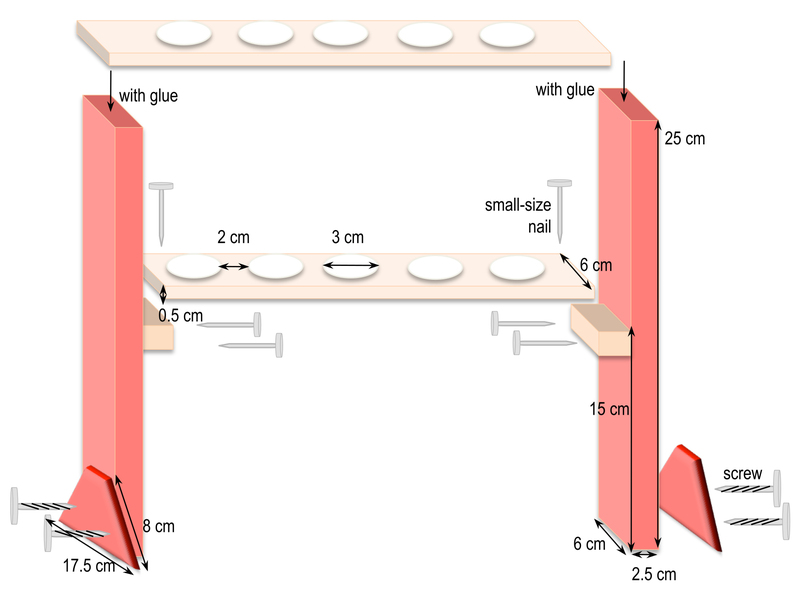 Cut the different pieces of wood according to the dimensions given in Figure 2. For example, to hold 6 syringes, the top piece is 37 cm long x 6 cm wide and the one underneath is 32 cm long x 6 cm wide. Adjust and maintain the two pieces together to drill the holes in a two-by-two alignment. Afterwards, assemble all the pieces together as shown in Figure 2. First, take an 18 G needle with a pair of tweezers, heat its collar over a flame to soften the glue and pull it with another pair of clamps. After cooling, adjust a small piece of silicone tube (1.14 mm internal diameter) of about 3 cm long on the top of the needle. Take a skirt cap and stitch 6 needles into its top and close its bottom by a 1 ml pipette tip previously cut at its finest end. If necessary, add silicone paste to fragile places to strengthen the airproof of the system. To the cut end of the blue pipette tip, add a piece of silicone tube (3.17 mm internal diameter) about 20 cm long that will be plugged later into a sterile air filter placed between the air pump and the connector (see Figure 4). Finally, place the whole system [connector + PTFE tubes + large diameter silicone tube] in an autoclavable bag and sterilize it by autoclaving (115 °C, 40 min). Figure 4. Device used to incubate the plants with the mycelia of the ectomycorrhizal fungus. A. Syringe containing the interaction medium; B. Polycarbonate valve; C. Collection vessel; D. Mycelium; E. Root system of the interacting plant; F. Nichrome wire bearing the mycelium; G. Glass funnel to minimize evaporation; H. Home-made connector for gathering 4 to 7 PTFE microtubes; I. PTFE microtube for individual aeration; J. Sterile filter; K. Air pump. Each syringe can contain up to three P. pinaster seedlings. Remove the plunger of each syringe and discard it. Using a hot nail, drill a hole at the top of the syringe opposite to the graduations giving the volume. This hole will be used to place the microtube for aeration inside the syringe. Place all drilled syringes in an autoclavable bag and sterilize it by autoclaving (115 °C, 40 min). First, prepare germination plates by pouring 25 ml of Agar-agar + glucose (see Recipes) solution in 90 mm Petri dishes. Generally, 8 seeds are put in one Petri dish and this ratio is used to calculate the total number of Petri dishes to be prepared. In our work we use seeds of maritime pine (Pinus pinaster Soland in Ait.) of Médoc provenance, originating from Landes-Sore-VG (France). The seeds, whose number is converted in g using the weight of 10 seeds, are first soaked for 48 h at 4 °C in deionized water as we noticed that this soaking improved the success of disinfection. After removing water, the seeds are placed into a large Petri dish (diameter 150 mm) in a laminar flow cabinet. They are then covered with pure, concentrated H2O2 (30%). After 50 min, H2O2 solution is discarded. Then, the seeds are rinsed several times with roughly 1 L of sterile deionized water. After the last rinse, all the water is withdrawn from the dish with a sterile syringe and the seeds are allowed to become completely dry in the laminar flow cabinet. The seeds are then oriented with the root down and deposited on the solid medium, on a single line in the middle of the dish. The dish is closed with sealing film and placed vertically in a box to save space and to get straight roots that do not penetrate into the solid medium. The box is incubated in the dark, at 25 °C. The first seeds (about 10%) germinate after 10 days and the maximum of germination occurs within 2 to 3 weeks. Open the bag containing sterile test tubes in a laminar flow cabinet. Discard the largest possible volume of glucose solution by pouring it into a sterile beaker. This step is very important to avoid contaminations. Then, add 15 ml of nutrient solution (N1 + P, see Recipes) in each tube of a rack with the 60 ml syringe. Cut the sealing film into strips of 25 x 150 mm (one per tube). Open the Petri dishes with germinated seeds by discarding the sealing film. Take a tube in one hand and move the filter paper away from the wall of the glass tube with a flame-sterilized spatula held in the other hand. Take a germinated seedling with tweezers and insert its root between the glass and the paper. Use the seeds with a root length of at least 7 cm and with teguments still covering the cotyledons. Gently press the filter paper against the root and close the tube with the sealing film by making several turns around the hypocotyl to completely close all the openings. Place the tube with the seedling (Figure 1) in another rack outside the laminar flow cabinet. Place the tubes in a growth cabinet with controlled light and humidity. We generally use the following parameters to grow the plants: a 16/8 h light/dark cycle at 25 °C/20 °C, 60%/80% RH, CO2 concentration of about 350 x 10-6 dm-3 and a PAR (Photosynthetically Active Radiation) of approximately 400 μmol m-2 sec-1 (400-700 nm). Maintain the nutrient solution at 15 ml by adding regularly new nutrient solution under sterile conditions. Use a needle (18 G) equipped with a 40 mm-long piece of silicone tubing (int diam 1.14 mm). Several needles are prepared, placed in 125 ml polypropylene containers and autoclaved at 121 °C for 20 min. At the time of re-filling the test tubes, open the container under sterile conditions and connect a needle onto a sterile 60 ml Luer syringe filled with nutrient solution. Open first the PTFE microtube of a test tube by taking off the stopper (silicone tubing + burned 200 µl tip). Connect the open extremity of the microtube with the silicone tubing protruding from the syringe. Push the nutrient solution into the test tube until the wanted volume. Withdrawn the syringe and close back the PTFE microtube with its stopper. In our work (Torres-Aquino et al., 2017) we used 2-month old maritime pines. Six days before the incubation with the mycelia, the nutrient solution of each test tube is replaced by 30 ml of sterile CaSO4 (see Recipes). Six or seven test tubes are connected together by plugging one of the PTFE microtube in a home-made needle holder (Figure 3). The holder is connected to a sterile filter and the racks with the plants are transferred into the growth cabinet. The filter is then connected to an air pump to provide a sterile aeration to each test tube. After 5 days, the CaSO4 solution is replaced by 30 ml of interaction medium (see Recipes) for 24 h to acclimatize the roots to this new medium. Disconnect the PTFE microtube from the connector and remove the sealing film. Take the plant out of the test tubes by hand. Add it to the 60 ml syringes containing a 32P labelled mycelium previously grown and rinsed as described in Becquer et al. (2017). In our work, we put three 2-month-old maritime pine seedlings in each syringe that contains 60 ml of interaction medium and a mycelium of the ectomycorrhizal basidiomycete Hebeloma cylindrosporum (about 0.2 g of fresh weight) suspended in the syringe by a nichrome wire (see Figure 4). Take a connector with PTFE microtubes (Figure 3) and insert one PTFE microtube into each syringe through the hole and connect the connector to an air pump. Adjust the flow rate of the pump and the position of the PTFE microtubes so as to obtain equivalent ventilation in all syringes. Add a glass funnel at the top of each syringe to minimize the evaporation of the medium. Incubate the plants and the fungi under laboratory light continuously for up to 48 h.
To study the effect of plant on 32P efflux from the fungus, take 1 ml of interaction medium after 6, 24 and 48 h of incubation and measure the radioactivity as described in detail in our previous protocol (Becquer et al., 2017). Before sampling, do not forget to record the actual volume of interaction medium in the syringe. At the end of incubation, record the fresh weight of each mycelium and measure their radioactivity (for details, see Becquer et al., 2017). Take also each plant; blot it between filter paper sheets, separate roots from shoots and record their fresh weight. Then place the whole plant (roots + shoots) in a 20 ml scintillation vial and measure the radioactivity as described in Becquer et al. (2017). Refer to our previous protocol to correct the raw data (generally given in cpm = counts per minute) for decay (Becquer et al., 2017). To calculate the whole amount of radioactivity lost by the fungus over 48 h, add the values of cpm measured in interaction medium (0-48 h) with those measured in plants. Add these previous values with those measured in the fungus before plant addition to get the total amount of radioactivity taken up by the fungus. Transform the values of cpm in Becquerel using the formula given in Becquer et al. (2017). When the fungus is labelled with 32P (see Becquer et al., 2017), the number of replicates per treatment should be at least 6 and the experiments should be repeated twice. Results can be expressed either as the percentage of initial radioactivity lost by the fungus or per g of fungal fresh weight. The normality of data is tested using the Kolmogorov Smirnov test and, where necessary, the data are either square root or log10 transformed prior to analysis to meet the assumptions of ANOVA. The effect of incubation time (e.g., 6, 24 or 48 h) and of the biological conditions (the fungus alone versus the fungus with the plant) can be assessed using one way- or two way-ANOVA. In the disinfection step of maritime pine seeds, the person must wear gloves to avoid any burning from skin contact with pure, concentrated H2O2. The seeds must have a good contact with H2O2 for efficient disinfection. At the time of seedling transfer into the test tube, it is very important that they have their tegument covering the cotyledons. Without this tegument, the young seedling will dry very quickly and die. In case the tegument has been lost, the seedlings can be protected from air drying by covering with a filter paper, well-moistened with deionized water. 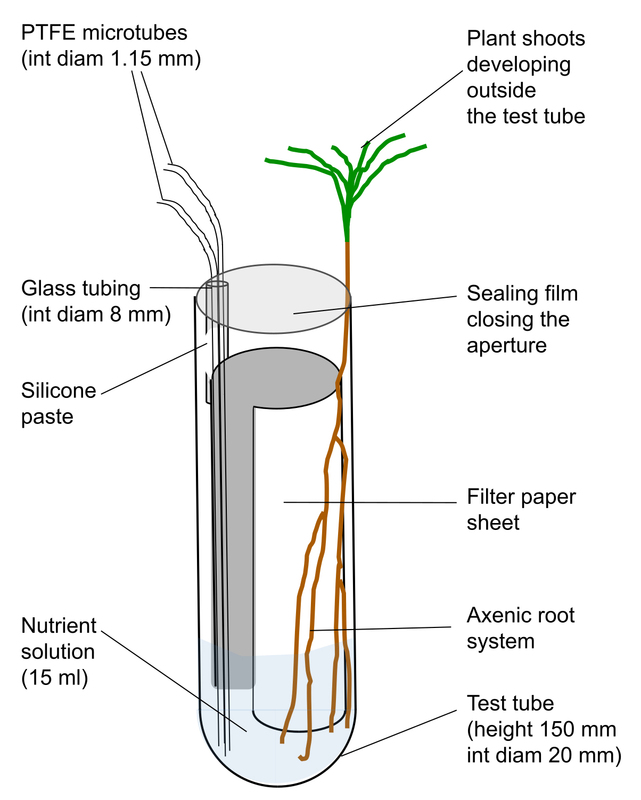 Depending on the number of plants required for the experiments, it is possible to place 2 germinated seeds side by side in the tube. In this case, it is necessary to monitor the level of the nutrient solution very frequently. Since the risk of contamination of filter paper with bacteria or saprophytic fungi is never zero, we usually prepare 10% more plants than needed. This research was supported by INRA (France) through annual funding devoted to their researchers and a fellowship through a Contract for Young Scientist (CJS) granted to Adeline Becquer, and by CONACYT (Mexico) through a Ph-D fellowship granted to Margarita Torres-Aquino. The protocol is adapted from our previous work (Plassard et al., 1994; Torres-Aquino et al., 2017). We also thank the three anonymous reviewers for their helpful comments to improve the protocol. Becquer, A., Torres-Aquino, M., Le Guernevé, C., Amenc, L.K., Trives-segura, C., Staunton, S., Quiquampoix, H. and Plassard, C. (2017). A Method for Radioactive labelling of Hebeloma cylindrosporum to study plant-fungus interactions. Bio Protoc 7(20): e2576. Cairney, J. W. G. (2011). Ectomycorrhizal fungi: the symbiotic route to the root for phosphorus in forest soils. Plant Soil 344: 51-71. Plassard, C., Barry, D., Eltrop, L. and Mousain, D. (1994). Nitrate uptake in maritime pine (Pinus pinaster) and the ectomycorrhizal fungus Hebeloma cylindrosporum: effect of ectomycorrhizal symbiosis. Can J Bot 72: 189-197. Plassard, C. and Dell, B. (2010). Phosphorus nutrition of mycorrhizal trees. Tree Physiol 30(9): 1129-1139. Smith, S. E. and Read, D. J. (2008). Mycorrhizal symbiosis. 3rd edition. Academic Press. Smith, S. E., Anderson, I. C. and Smith, F. A. (2015). Mycorrhizal associations and phosphorus acquisition: from cells to ecosystems. Annual Plant Reviews 48: 409-440. Torres-Aquino, M., Becquer, A., Le Guerneve, C., Louche, J., Amenc, L. K., Staunton, S., Quiquampoix, H. and Plassard, C. (2017). The host plant Pinus pinaster exerts specific effects on phosphate efflux and polyphosphate metabolism of the ectomycorrhizal fungus Hebeloma cylindrosporum: a radiotracer, cytological staining and 31P NMR spectroscopy study. Plant Cell Environ 40(2): 190-202. How to cite: Becquer, A., Torres-Aquino, M., Le Guernevé, C., Amenc, L. K., Trives-Segura, C., Staunton, S., Quiquampoix, H. and Plassard, C. (2017). Establishing a Symbiotic Interface between Cultured Ectomycorrhizal Fungi and Plants to Follow Fungal Phosphate Metabolism. Bio-protocol 7(20): e2577. DOI: 10.21769/BioProtoc.2577.